So this [fishhook] probably saved a lot of people’s lives. 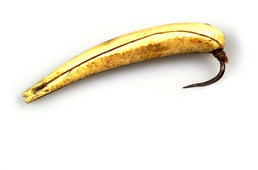 This ivory hook with a metal barb is for larger fish such as salmon and rockfish. Oscar Koutchak: This is made out of ivory. This was made for larger fish than grayling or small trout. It could be used maybe for dog salmon or chum, or silver salmon. Theresa Nanouk: King salmon or rockfish, right? Oscar Koutchak: Yes, or rockfish. You can put the bait on here real easy. This must be fairly new. This [metal hook] could be made from . . . . Well, the Russians were the first ones in our area, especially north of Unalakleet, and they established a trading post there at one time. So this metal must have come from there. Theresa Nanouk: Because it’s made out of a nail. Oscar Koutchak: Yes. I like this one here. Stephen Loring: It would be used for jigging? Stephen Loring: What would they use for fishing line? Oscar Koutchak: Something like this [babiche]. (1) I imagine it’s made a little bit thinner. And it’s very pliable when it gets wet. You can do anything with it. So this [fishhook] probably saved a lot of people’s lives, with fish. 1. According to Iñupiaq Elder Frances Charles, babiche is “sealskin rope, sealskin line” and is made from strips of scraped, untanned sealskin. The word is adapted from Canadian French and originally from Algonquian.